Card game lovers all over the world have been enjoying Rummy Games, for a couple of centuries now. The fantastic card game has numerous variations, that are played in different parts of the world. Whatever the names of these versions of rummy might be, the basic aspects are more or less similar. All rummy games are essentially card melding games. The aim is to meld the cards in hand into relevant sequences and/or sets, by drawing and discarding cards. Advancements in science and technology ushered in Online Rummy, the magnificent tech savvy avatar of the traditional card game of skills. There are a number of varied hypotheses about the origin and history of rummy card game. How many of us have an idea about the evolution of this amazing game? Did the Game Originate in Spain? The most popular and widely accepted proposition about rummy is that it evolved from ‘Conquian’, a game that originated in Spain or Mexico. It is believed that the Spanish people invented it and it moved to America with Spanish migrants. It is said to have spread throughout America during the nineteenth century. Conquian is deemed to be the very first instance of rummy, from which all other Rummy Variants developed. 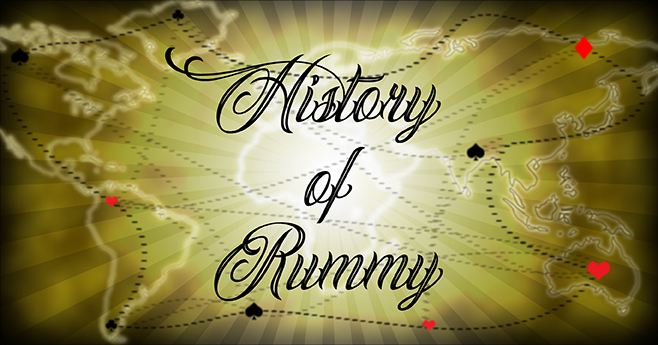 Most of the popular beliefs about the origin of rummy relate it to either Europe or North America. However, there is another notion too that links the game to Asia. There existed a card game known as ‘Mahjong’ in China almost a thousand years ago. It was played with the same pick and drop style as rummy. This fact forms the basis of the assertion that rummy has its origin in China. In the nineteenth century, the same game came to be known by other names such as ‘Khanhoo’ and ‘Kon Khin’. The Chinese loved to play it. Hence, there is a possibility that the game of Rummy may have originated in Asia and subsequently reached India. One theory speculates that rummy evolved from the Japanese game ‘Hanafuda’, which was developed by the Portuguese people who travelled to Japan. Does it Have anything to do with Poker? Another surmise is that a format of Poker called Whiskey Poker evolved into rummy. It is perceived that the former game was quite similar to the contemporary rummy. Later on, it came to be known as Rum Poker and finally rummy. Did it Exist at the Time of World War 1? In Hungary, newspapers reported the presence of Rummy after WW1. However, it had probably emerged around 1915 – at coffee shop tables in Pest division of Budapest city. It soon became a hot favourite with the denizens. So, it is safe to assume that it did exist at the time of WW1. Why did the Game become so Popular? The game is pretty easy to learn and play, but nonetheless very interesting. Moreover, nothing is required except a deck of cards and fellow players. The simple game throws new challenges every time it is played. Players have to apply their mental resources to play the game well. It was quite an attractive way to entertain oneself in the era that had limited amusement options. The game garnered a lot of popularity in the 1930s when it was played by renowned Hollywood stars with great zeal. Popularity of the game witnessed a surge during the Great Depression when the masses preferred to stay indoors and amuse themselves by playing inexpensive games. How did the Game Get the Name Rummy? It is believed that the word ‘rummy’ comes from the word ‘rum’, which is British slang for odd, peculiar, strange or queer. It could have been the way the British initially saw the game. Many people think that it could have also come from ‘Rum Poker’ as the game is assumed to be the ancestor of all rummy games. It is also believed that the name has come from the alcoholic beverage rum, as in the beginning the defeated player was supposed to pay for the next round of drinks. We cannot be very sure about the origin, evolution and history of the highly entertaining game. However, what is sure is that the game has transcended all borders to gain a universal appeal. People of all ages and nationalities love to indulge in this engaging pastime. Another worth noting point is that with the passage of time, people’s interest in rummy has not waned. It has, in fact, catapulted over the years and now, the game is setting new benchmarks with Online Rummy breaking all the previous records.